Wondering Willis Eschenbach wanders further from reality in a follow up article at WUWT on CERES (archived here, latest update here). ...the system works as follows. When the GHGs increase, the TOA upwelling longwave radiation decreases because more is absorbed. In response, the albedo increases proportionately, increases the SR. This counteracts the decrease in upwelling LW, and leaves the surface temperature unchanged. The evidence he provides is that he says he has found "the longwave and the reflected shortwave is strongly negatively correlated, and averages -0.65 globally". 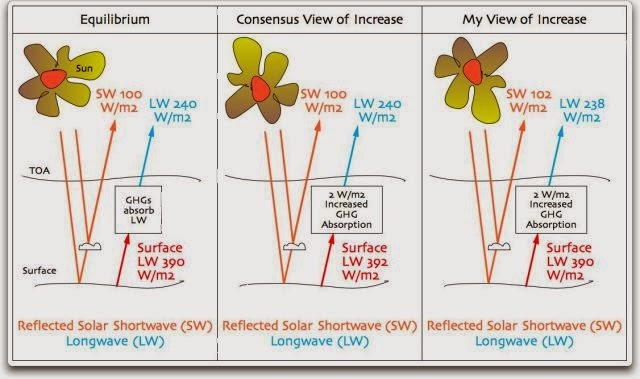 By which I think he means that as outgoing longwave radiation decreases, reflected shortwave radiation increases. It looks as if Willis is proposing a version of Lindzen's Iris Hypothesis, which was long ago found wanting. But despite being asked at least twice (once today and once on a previous occasion), Willis hasn't acknowledged that. He wants to claim the idea for himself. 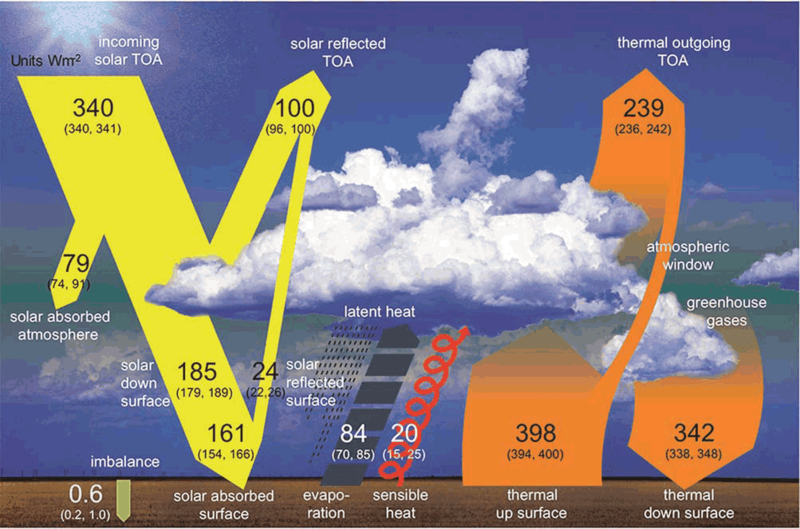 the earth has a strong active thermoregulation system which functions in part by adjusting the albedo (through the regulation of daily tropical cloud onset time) to maintain the earth within a narrow (± 0.3°C over the 20th century) temperature range. Funny thing, apart from Willis chastising someone else for "not checking facts very carefully" (when you think you’ve uncovered a “major error”, something really obvious), is that no-one has asked him where the energy is coming from that's heating the surface and the oceans and melting ice. Everyone seems to want him to be correct, so they aren't seeing the big fat flaw in his argument. And no-one has asked for evidence supporting his cloud hypothesis either. But a couple of people have questioned him. For example, one person asked him why he sees clouds as only reflecting incoming shortwave radiation and not longwave radiation from the surface. Willis is quickly adding runs to his "crackpot" score using the points system idunno linked to. The estimate for the reflected solar radiation at the TOA in Figure 2.11, 100 W/m2, is a rounded value based on the CERES Energy Balanced and Filled (EBAF) satellite data product (Loeb et al., 2009; Loeb et al., 2012b) for the period 2001–2010. This dataset adjusts the solar and thermal TOA fluxes within their range of uncertainty to be consistent with independent estimates of the global heating rate based upon in situ ocean observations (Loeb et al., 2012b). This leaves 240 W/m2 of solar radiation absorbed by Earth, which is nearly balanced by thermal emission to space of about 239 W/m2 (based on CERES EBAF), considering a global heat storage of 0.6 W/m2 (imbalance term in Figure 2.11) based on Argo data from 2005 to 2010 (Hansen et al., 2011; Loeb et al., 2012b; Box 3.1). Now for how scientists portray the global mean energy budget - Figure 2.11 from page 2-127 of the final draft of WG1. Click to enlarge. Amended slightly, because Willis didn't begin his description but came in later. As a result, we can say that atmospheric GHGs including CO2 most assuredly are radiating more energy than they are absorbing, in the ratio of 610 / 350. GHGs must be running seriously low on energy. Willis is getting pwned in that thread something shocking, and his first response having been aggressive, he can't now back down. He's a nasty, ignorant, stupid piece of work. Watt about a night out at the bingo? Obviously, there's more credible science to wade through with Inferno than Watts, but I think that the compare and contrast could be an excellent way for you to show Tony how its really done.